I will admit to cheating a little with Heart-Shaped Box, as I had already read it several years before. It was my book of choice on a college trip to Berlin and I remember some good evenings spent curled up in a youth hostel scaring myself silly. But I'd forgotten some of the details of the book and thought that now would be a good time to remind myself of why I loved this book. Heart-Shaped Box follows Judas Coyne, a middle-aged rock star who has gone into semi-retirement following the deaths of the majority of his band, and generally being tired with the whole business of being a rock star. He receives an email that says "Buy my stepfather's ghost". As he has a collection of the macabre, mostly consisting of twisted gifts from his fans, it seems like the perfect addition. 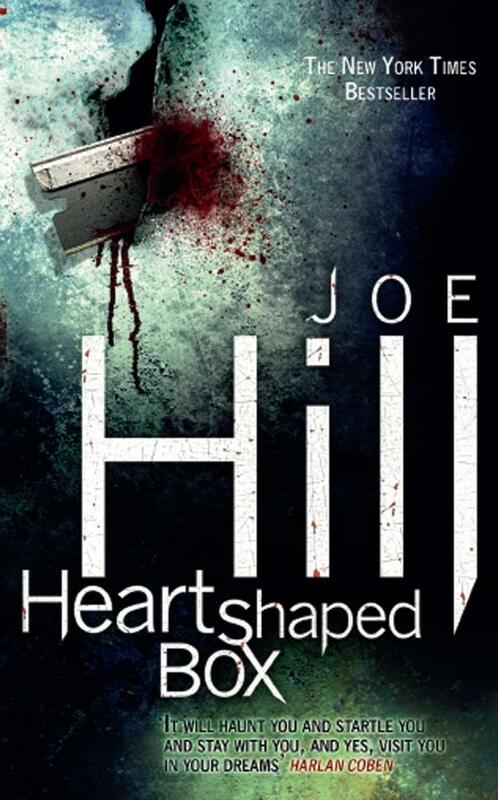 But when the ghost is delivered to Jude, a dead man's suit in a black heart-shaped box, he finds that the ghost that he has allowed into his life had a grudge against him during life and is hardly about to let death stand in the way of his plans for revenge. 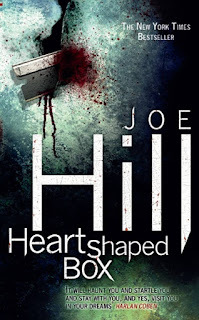 I really loved Heart-Shaped Box the first time round, and the second time was similarly entertaining. I will say during this second read, there were a couple things that stuck out as needing work that I didn't notice as a younger woman. But I'll start with what the book gets right. Firstly, I personally really liked the main characters, Jude and Georgia/Marybeth. I've seen a lot of reviews that criticise them for being flat and predictable, but I think that's too harsh a line to take. Sure, ageing rock star and his significantly younger groupie girlfriend isn't exactly the most original of archetypes to run with, but I don't take much issue with this for a couple of reasons. First of all, you don't tend to get these character archetypes as the main protagonists, so I'm happy to switch focus to them for a while. Second, the development that they both go is pretty damn significant, even if it's kept a bit low-key compared to the whole "we're being chased by a homicidal ghost" thing. They go from being a pair of desperately unhappy people who are unable to deal with all of their emotional baggage to a couple that can last through thick and thin, knowing that there's someone who has seen them at their worst and decided to stick around. The villain, Craddock, is a bit on the cartoonishly evil side of things, having pretty much no positive features either alive or dead, but then I think that's about right when it comes to the supernatural. For me, there is a big factor about a supernatural evil that influences how scary I find them, which is whether they can be reasoned with. It's the reason that I find zombies much worse than vampires. With vampires, there's the potential for a spark of humanity that can be exploited by the quick-witted to possibly get out of the situation alive. With zombies, there is no reasoning with them, leaving you with a zero-sum situation. Craddock has no positive qualities or virtues that can be appealed to and combined with his incorporeal form and eerie mind powers makes him a formidable foe. The main issue that I had with Heart-Shaped Box in my second reading was that the really unsettling stuff seems to be in the first part, with each subsequent part getting less scary as it goes on. This could be because as they go on, Jude and Marybeth gather some additional tools to combat Craddock with. But then they also get increasingly on-edge and beaten up, so that sort of balances out. Part of it is probably that the character development does make up a big chunk of the road trip that takes up the latter part of the novel. But the thing that sticks out in my mind most is a scene right near the end of the first part which is just so fucked-up and creepy that pretty much everything after it pales in comparison. Afterwards the horror is more slow-burn, which only emphasises how good that shock to the system scare is.